Audi A8 is undoubtedly one of the most luxurious saloons available in the automobile market. This car is has now received cosmetic updates along with some changes to its engine, which enhanced its performance. The manufacturer is offering this saloon in three trims among which, Audi A8 L 3.0 TDI Quattro is one of the diesel variants. It is equipped with a 3.0-litre turbocharged diesel engine, which is capable of producing 30Nm more torque than its predecessor. This power plant is paired with an eight speed tiptronic automobile gearbox that enables the motor to deliver a flawless performance. 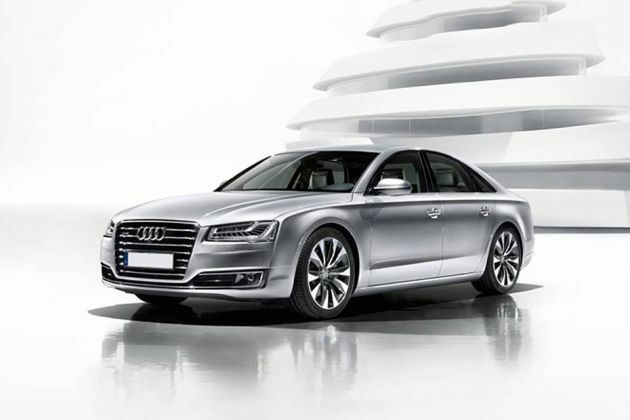 The 2014 version of Audi A8 is all about cosmetic updates in terms of both exteriors and interiors. As far as the exteriors are concerned, this trim gets a re-structured radiator grille along with a sleeker bumper that adds an aggressive look to the frontage. It is also offered with an optional Matrix LED headlamps that produces high beam and adapts itself according to the road conditions. Coming to the interiors, this luxury saloon comes with an option to choose from 23 color schemes, which is interesting. On the other hand, the car maker is offering this trim with sophisticated features like four zone automatic AC unit, electrically adjustable seats with memory function, MMI navigation system and numerous other advanced aspects. The latest version gets minor cosmetic updates, which augments its elegance. To start with the rear, its taillight cluster is tweaked with improved LED light setup that amplifies the rear profile. The build quality of the boot lid is slightly improved and it is elegantly decorated with a chrome appliqué and with the iconic company's badge. The rear bumper has been retained, but it is fitted with a newly crafted dual chrome exhaust pipes, which emphasizes the elegance. There are minor updates given to the side profile, but it still looks very decent. The external mirror caps along with the door handles are in body color, while the window sill surround gets chrome treatment. Its wheel arches have been equipped with a set of 18 inch alloy wheels as standard. The company is also offering an option to choose from 19 and 20 inch rims with different style that changes the look of its side profile. A major update has been given to the front profile with a refurbished bumper, which is sleek and is incorporated with a wider air dam with a chrome surround. The front radiator grille gets a slight modification and received a lot of chrome treatment. Surrounding this grille is the sleeker headlight cluster that is incorporated with high intensity LED headlamps and daytime running lights. The manufacturer is also offering the Matrix LED headlamps as an optional feature, which is capable of producing high intensity beam and can adapt to the road situation. Coming to the interiors, the all new Audi A8 L gets improved leg space and with an option to customize from many color schemes. In addition to these, the manufacturer is also offering an option to choose between 12 wooden inserts that further enhances the opulence of interiors. This saloon also comes in a number of other interior options including Audi exclusive inlays, extended leather package, exclusive seat belts, carpets, floor mats, yacht shaped wooden gear shift lever and much more. The best part about the interiors is its extremely spacious second row, which can be further extended by moving the front seats forward. In addition to this, the manufacturer has arranged entertainment facility to the rear occupants with two 10.2 inch LCD high resolution displays that provides access to audio and video files. It is also available with an option to install an Audi exclusive cool box with a storage compartment for two 1 litre bottles along with interior LED lighting. Powering this trim is an improved 3.0-litre turbocharged diesel engine with common rail injection system. This V6 engine is incorporated with piezo injectors that ensures precise distribution of fuel into the thrusters and reduces the fuel consumption by about 30 percent without compromising the power and performance. It can produce a maximum power of 246.64bhp between 4000 to 4250rpm that results in developing a peak torque output of 580Nm between 1750 to 2500rpm. This power plant is paired with an 8-speed automatic transmission gearbox that allows all the four wheels to derive torque output using Quattro permanent all wheel drive technology. This luxury saloon is blessed with an adaptive air suspension system that automatically regulates the damping and height of the vehicle with infinitely variable adaptive damping. This electronically controlled air suspension system acts individually at each wheel and provides excellent driving experience. On the other hand, this saloon is blessed with ventilated disc brakes fitted to all its four wheels, which are coupled with high performance brake calipers. The car maker has also incorporated ABS with EBD and brake assist system that augments the overall braking mechanism. Additionally, the car maker has installed an electromechanical power steering system with speed related function, which provides greater assistance even at high speeds. This Audi A8 L 3.0 TDI Quattro trim is packed with some of the most innovative comfort features. The list includes ambient interior light package, inside rear view mirror with anti glare effect, yacht shaped leather gearshift lever, front sun visors with vanity mirror, 4-zone deluxe automatic air conditioning system, Audi parking system with rear view camera, Audi pre-sense basic, comfort front center armrest and so on. It also has aspects like front passengers seat adjustment from rear , energy recovery system, cruise control, electrically adjustable seats with memory function, power assisted closing for doors and various other aspects. This luxury saloon is also blessed with an advanced infotainment system featuring Bose sound system along with MMI touch system that supports Audi music interface, radio, Bluetooth connectivity and 6-DVD changer. The car maker has not compromised on the most crucial safety aspects of this trim. It comes with a list including tyre pressure monitoring system, space saving spare wheel, anti-theft alarm with tow away protection, anti-theft wheel bolts , first aid kit with warning triangle and full size airbags. 1. A sophisticated vehicle with luxurious interiors. 2. Engine is tuned to produce more power and perform better. 1. Audi exclusive packages can be offered as standard across all the variants. 2. Lesser service stations is a big minus. ఆడి ఏ8 17 వేర్వేరు రంగులలో అందుబాటులో ఉంది - Brilliant Black, Palace Blue Pearl E&#64256;ect, Cuvée Silver Metallic, Ipanema Brown Metallic, Claasice Red Pearl Effect, Ibis White, Sand Beige Pearl E&#64256;ect, Argus Brown Metallic, Glacier white Metallic, Oolong Grey Metallic, Moonlight Blue Metallic, ఫాంటమ్ Black Pearl Effect, Floret Silver Metallic, Havanna Black Metallic, Mamba Black Metallic, Saddle Brown Pearl E&#64256;ect, Monsoon Gray Metallic.